Serenity Now: What Came First, the Newspaper or the Egg? I bet you have a bag full of those plastic Dollar Store eggs too. I keep mine in the attic now because certain small people were still playing "egg hunt" last July, and I got sick of finding them hidden under my couches and behind my pillows. I can only hide so many eggs before I get tired and want to come in and eat Peeps. So I decided to think up a little project to take care of a few of the extras. My supplies included newspaper, scissors, Mod Podge, plastic eggs, a small foam brush, and a mocha from Panera, because every good craft should be accompanied by caffeine. I cut small strips of newspaper first. Then I used my foam brush to apply a small amount of Mod Podge to the egg, laying strips of newspaper, spreading the pieces flat as I went. If you don't like getting your hands sticky, this is not the project for you. They still need to be smoothed out a little bit, but I think they are kind of fun. They might also look cute on a platter in a bed of moss, maybe paired with a little bunny. I've seen eggs died and decoupaged with just about everything else in the past year or so, so I thought why not try newspaper? The best part was that it cost me nothing because I had all of the supplies at home! The winner of The Peacock Shop Giveaway was Jessica from Adventures of a Wife and Mommy. Please email me by Friday so I can get you in touch with Kathlyn. Thanks again to Kathlyn for hosting such a fun Giveaway with me! If you didn't win, be sure to check out The Peacock Shop for some amazingly cute shopping. I hope you guys are still planning on joining in for the first Dishing It! party on April 14th. 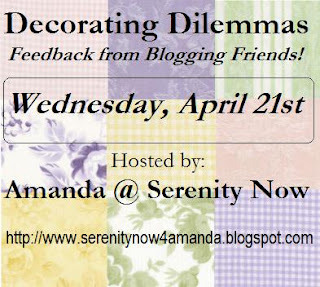 This new monthly party is my way of getting bloggers together to chat about a common topic. I'll post a question/topic a few days before the party, and ask everyone to link up and hop around. I think it will be a fun way for us to get to know other bloggers. 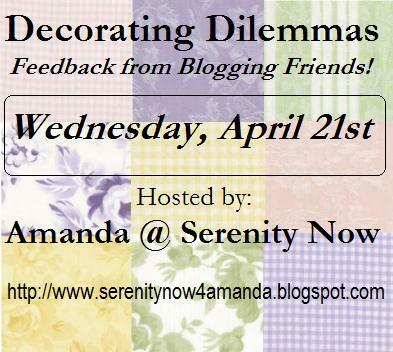 Also, in case you missed the announcement, the next Decorating Dilemmas Party is on for April 21st. That's my birthday, so please don't let me down. It's going to be a blast offering each other feedback on our Dilemmas and Solutions. Hope you'll join us! I'm linking up to Kimba's epic weekly DIY party. I'm also linking up to the super-fun Tutorial Tuesday at Hope Studios! I love this! So much prettier than plastic eggs! Those are cute! I remember reading instructions for a craft, years ago; I purchased the supplies but never tried it! The original project used wood eggs, but I can't imagine that plastic wouldn't work. In any case, you coat the eggs in glue then roll them in colored sand. The result was a textured finish, a little bit sparkly. Very cute! I love them displayed in the vase. Stopping by from SITS. Happy Monday! Those are darling! And what a good decoration for someone who's so good with words. Rock on, thrifty mommy! These are so pretty! I love how newspaper can look so chic when it is used in decorating! Love it! Very cute! I was thinking of doing something just like it but with scrapbook paper! Cute eggs! I have some plastic ones set aside for my boys to do something with this week! Great idea & so easy! Very cute! Dropping by from SITS! a very cute idea! love that you repurposed that newspaper. I love your newspaper eggs!! Very cool and very easy!! Right now though, I need that coffee of yours! What a neat idea! Love it. .
That's a great project idea!! :) Looks so cute! Holy Cow!! These are SOOO Cute!! I have TONS of eggs, and there is newspaper in my recycle bin. Hmmmm.... Now I just need some TIME. Does anyone have some they will loan me? I got my cool prize magazine today! It totally rocks! I cannot thank you enough. I'll totally blame you for the 5 pounds I'm about to gain by making all of those yummy recipes! HA! HA! Thanks again!! Gosh, I say totally a LOT. I must be a child of the 80's! Cute! I did the same thing a few weeks ago with paper from vintge sheet music and a book. I love the change up from the normal pastel Easter colors. Very cute! I would never have thought about using newspaper. You'll have these for years, too. doesn't that sound perfect too??!! hm.... I can't wait!! fun fun!! except I only have glitter mod podge! I think it will work!! What a great idea..and it looks so easy! Yay! I won! So excited!!! Hi Amanda, I had to come over and check out your newspaper eggs after you commented on my blog that you had made them last year. They're great! You are right that this is not a project to try if you don't like getting your hands dirty! Thanks for hosting the link party and for the visit. Cheers!